Launching a scathing attack on Andhra Chief Minister N Chandrababu Naidu, Prime Minister Narendra Modi on Sunday called him a master in backstabbing and destroying the dreams of people of the state. "He is senior in forging new alliances. He is scared of losing the elections. He is a master having backstabbed his own father-in-law (N T Rama Rao). He is senior in destroying the dreams of Andhra Pradesh people. What has happened to Chandrababu Naidu? Why does he keep pointing out that he is my senior?" Modi said addressing a public meeting titled "Praja Chaitanya Sabha" here. Invoking the history of the Telugu Desam Party (TDP), he said that the Chief Minister had diluted the anti-Congress politics of its founder N T Rama Rao. "The leader of the TDP who should have worked for Congress-free India is now supporting the Congress party. He has never been able to win a second election and is afraid of losing badly in polls. He is attempting to stabilise his son in politics. He is creating own wealth and 'chowkidar' is giving him sleepless nights," the Prime Minister said. "On the foundation of lies, they are playing the game of 'mahamilawat' (adulteration). Such is the effect of the company that the Chief Minister of Andhra Pradesh has also forgotten the development of state and has jumped in the competition of abusing Modi," he said. The TDP pulled out of the NDA last year over the Centre's refusal to grant special category status to Andhra Pradesh. Naidu took a U-turn after promising to turn around the infrastructure of Andhra Pradesh, alleged Modi who said. the Chief Minister has become busy in promoting his family rather than working for the re-development of Amravati. The Prime Minister also alleged that while Naidu had promised sunrise for Andhra Pradesh he is busy in facilitating the rise of his own son. Modi also attacked Naidu for his planned Delhi protest and said, "It is with public funds that the Andhra Pradesh Chief Minister is going to Delhi for a photo-op." On the protests by TDP workers against his visit, Modi said, "I am indebted to the TDP who has told me to go back and wants me to sit in Delhi once again. I have full faith in crores of people that they will fulfill the wish of the TDP and re-elect Modi." He accused the state government of not utilising in an efficient manner central funds released for the development of Andhra Pradesh. Outlining that projects worth hundreds of crore concerning petroleum infrastructure were inaugurated by him in the state, he said, "These projects are significant not only for Andhra Pradesh but also for the energy security of the country. "In the tough times, the country doesn't have to face any scarcity of petroleum products; hence petroleum reserves are being created in different regions. A similar important reserve has also been made in Vishakhapatnam." "As of now, over 6.25 crore free LPG connections have been given," the Prime Minister said. 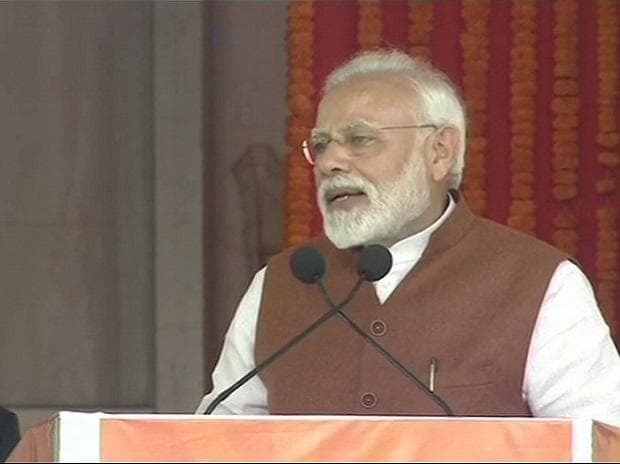 The Prime Minister said "LPG facility had begun in 1955 and in over 60 years, 12 crore gas connections were given. Our government in the last 4.5 years has already given about 13 crore gas connections. While in 2014 only 55 per cent of people had gas connection, today the number has increased to about 90 per cent."